Following is an email I received today from Stacy. The opinions expressed in his email are solely those of Stacy Brown and most definitely do not reflect my personal views. One of the things I admired about Priscilla and Lisa Marie Presley as well as Elvis' "inner circle" and his fans was they did NOT try and change history. Change facts. They never denied Elvis' problems and what's ironic is that Elvis, to my memory, never spoke of any addiction to drugs. Michael Jackson HIMSELF admitted that he had a drug problem as early as 1985. He checked into rehab in 1993 and his brothers and sisters attempted interventions in 2001, 2002, 2003, 2006 and 2008. Now, Jermaine Jackson and a lot of the grief-stricken fans want to change history and say Michael Jackson was not an addict. a problem and then using that to help get a powerful message out about drug addiction. They've used their dead brother for financial gain since his death, why not use him for good and to help millions of others who battle the disease of addiction every day? Supposedly, Michael Jackson was this great humanitarian so wouldn't he want to do that? 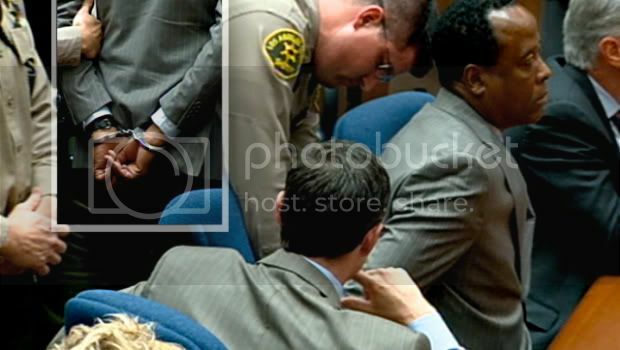 And, this does not absolve Conrad Murray in any way. Evidence has proven beyond a reasonable heck beyond a shadow of a doubt that he's guilty as charged. Also, Joseph, Jermaine, Latoya and others had been on television several times saying Michael's death was a conspiracy and that Murray was the "fall guy." Jermaine even said they erased tapes. In court, they showed surveillance of Michael returning home one last time and they said the tapes were indeed erased. Shouldn't the family and fans (unless they've changed their theory and now believe only Murray is involved - although the trial has revealed Katherine is suing AEG for wrongful death) be shouting more about that and not rejoicing over Murray's downfall. After all, word is that he will probably spend no more than a few weeks in a county lock up and then be put on house arrest for the remainder of his sentence. The conviction will end Murray's medical career and we all know that he's broke, so any civil judgement Joseph Jackson may win against Murray will be for naught. The problem with the Jacksons and Michael's fans these days is that none want to hear reason. Too bad for them. What a shame. it just came across wrong. I don’t think that even his adversaries second-guess Mr. Jackson’s contributions to the world culture and the people of the World, be it his artistic contributions, and be it his philanthropic contributions. Mr. Jackson always put his check book where his mouth is and generously helped others in need. Simply put, no one and nothing could take that away from Mr. Jackson; an attempt to do so would be foolish, malicious, unfair and futile. In 2000, Guinness World Records book crowned Mr. Jackson “King of Charity”. I respectfully disagree with you on Michael’s alleged addiction. Michael went to doctors to seek cure for his insomnia. Have you ever had chronic insomnia for days or even months? I have and at the end of the day, I recall my day as if I am a spectator. It is really hard on mind and body. What exactly is Michael Jackson guilty of, wanting to sleep 8 hours a day? As people say, he was Michael Jackson; he could have acquired drugs without stating an ailment. This man went to doctors to cure his insomnia. His patient files reflect insomnia. He even tried, with Cherilyn Lee, holistic approach to cure his insomnia. His history of addiction doesn’t mean that he died as an addict. It was always easy to target Mr. Jackson with unsubstantiated allegations, more so now that he is dead and not here to speak for himself. a force for humanitarian causes around the world. His death shouldn't be used for yet another cause. It is high time for the world to honor Michael Jackson as a human being. He did enough good to this world! Now it is the world’s turn to do good for Michael Jackson for once. As far as bringing other culpable parties to justice, what have YOU done in this regard? The loyal fans dedicated over 2 years of their lives screaming the truth but when his own Family and friends’ sell their loyalty for money, there is not much that the fans can do. I whole-heartedly agree with your comments about the Jacksons, particularly the people you named, who turned exploiting Michael Jackson, dead or alive, into an art form. Mr. Jackson was subjected to so much prejudice, malice and hatred. It would have been so easy for us, if we were in his shoes, to lose faith in humanity. Mr. Jackson endured the absolute worst from mankind yet he came out the other side like a champion. Still unjaded, Mr. Jackson continued to show love and be love until the very end of his life. Even after his death, if we are bunch of ingrates refusing to give him his dues and continue to persecute a dead man, it is a reflection of our character…or lack thereof. Maybe if we have fact that mj died an addict we the fans would addmit to MJ supposedly addiction, we have a trial going on and not even them can present hard fact to say if MJ was an addict. Too bad for you mr brown you can't tell us what MJ was addicted to? More like what drug? Every addict have a drug what was MJ drug of choice? for someone who have all the fact we the fans would like to see the evidence of MJ "addiction" depending on medication is a far way from an addiction to drug, what a shame you can't give us more facts. The important thing to remember is that at the time of his death he was not a drug addict. Saying that he was "supposedly" a great humanitarian is a huge understatement, it's a FACT that he is the most charitable celeb of all time (and that's probably not counting the money/time he gave to individual people). Not to be rude or disrespectful, but this post doesn't sound like someone concerned about something, it sounds like someone angry about something... Seems like you're letting your personal problems(or whatever you want to call them) get in the way here. The drugs that some say he was addicted to, ie demerol, weren't in his system at all and the report also showed that he wasn't taking ANY recreational drugs. Sure he had problems w/ pain killers in the past, there is a video on youtube of him speaking to the public about it in '95. But once again, at the time of his death he was NOT a drug addict. As an past addict once he picked up another drug he was back in his addiction. I know people don't want to hear that. People with addictions will go from drug to drug trying to find one they can handle. In addition, many will fool themselves into thinking that since a doctor is prescribing or administering they are not addicts. Unfortunately where I come from Micael would be known as a "garbage him" meaning that he would use anything that was available to him. There is still alot people need to know about addiction. The prosecution has shown through expert witnesses what Dr. Murray did wrong. He overlooked the basic rules apply to his profession, "Do no harm. " Stacy I have made a point to find out who you are over the last couple weeks. At first I thought you were a woman. You have been connected to the Jacksons for a long time. You are also closely connected to Nathaniel Brown, the husband of Rebbie Jackson. He hates the Jacksons! You're remarks are out of place here. I too am disgusted with some of the Jackson's recent project, but my reading up on this family tells me they're just doing what they always did. You can't change them, but you can change who you are. You do sound like an angry person. Leave the past where it belongs. I would love for Stacy Brown to explain how an addict has healthy organs. Perhaps he knows more than the coroner *sarcasm*. As someone who knew Michael for many years I am getting tired of seeing people come out of the woodwork claiming they know so much when in reality they know nothing. Michael wasn't perfect nor did he ever claim to be. His sleeping problems were well known to those close to him. This problem was exasperated whenever he went on tour and was one of the reasons he did not like to tour. I know of two sleep clinics that he went to- one in the later 90's and the other in early 2001. Each time he was given a prescription and basically sent on his way. Michael did not walk in to either of those facilities asking for medication. He went to get some answers as to why he was unable to sleep. Those doctors failed him, just as Conrad Murray did. Michael made it no secret that he was struggling with a dependency to prescription pills in the 90's. He was in excruciating pain after being burned. Only those who were there at the time know how bad things were. He had to have surgery several times after the incident. A balloon was inserted under the skin of his scalp and was "blown up" to stretch the skin out. This caused him a tremendous amount of pain. People such as Stacy Brown who are trying to link what occurred in the 90's to his death only make themselves look foolish. Well well well, this has to be one of the most vile things I have ever read--where do I start? I find it interesting Brown "admires" Lisa Marie Presley for not denying her father's problem when she has become very angry when her father's drug abuse is mentioned. She is NOT open to discussing his problem though she is open about her OWN problem. After his death she chose to portray Michael, someone she had not seen years prior to his death, someone she refused to call by name (or only by expletives) as a drug addict when she was not even around him to know what medications he took. She could not even name what medications he used when she lived with him. She had to go back in history and re-think things--his collapse in 1995 from dehydration suddenly was caused by drugs (when the medical doctor who attended to him said his collapse was not drug-related) and their divorce was from drugs (when reports were they disagreed as to when to have children). She has also provided different details as to how he proposed to her--I believe all the above would be considered re-writing history. Most of us know how Elvis died--he was in horrible health and had taken thousands of pills over the course of 1977 ALONE--he died alone in his bathroom. Michael died healthier than most, with under-utilized tablets in his room that were not written in excess. He died while being directly attended to by his physician Conrad Murray who chose to use propofol and lorazepam to treat insomnia that was worsened with strenuous night-time activity as would occur with anyone. I have never read that Michael admitted to a drug problem in 1985--so this sounds a bit like a re-writing of history, too. If Brown is trying to tie this into the burn--think again. Michael had had surgery on his nose prior to the burn (which would require pain medications) and whatever pain medications he received in 1984 from his burn were acceptable. A burn, especially to the scalp, is one of the most painful things someone could endure in their lifetime. Let me say this--I knew very little about Michael Jackson before he died. I am also a pharmacist. So far I have not come across any evidence of Michael being a drug addict. When I saw photos of the "Neverland Raid" I expected to see multiple pill bottles and vials galore--I saw FOUR prescription vials and ONE glass vial. I expected to see an autopsy report reflecting that of a man who abused drugs over the years--namely, liver damage. Instead, I read a report stating this man was healthier than most men his age. I read he had all these drugs in his home when he died--I see under-utilized medications leftover and no pain narcotics when supposedly he had a stash of every pain medication imaginable. What I see when I look at Michael's death is a man who had a legit medical problem which was exacerbated by touring--he sought treatment, he may have suggested an inappropriate treatment that was sadly suggested to him by physician--someone he trusted--and then a physician, possibly the same one who suggested the idea to him begin with, drugged this very healthy man. He did not actually drug him to death--he did not die from chronic use--he died as a direct result of Conrad Murray's actions--be it what he ordered, what he administered, how he refused to monitor his patient with any form of equipment and then refused to get appropriate aid to him in any reasonable amount of time. Michael Jackson did not die from drug addiction--he died because he was murdered. I am not saying this because I am not wanting to accept "the truth"--I am saying this because this is what the facts tell me thus far. I am a pharmacist and understand how drug addiction can affect people. Time and time again, the tabloids come up short with proving this man was a drug addict and they report false information. What they do fail to say is he suffered from lupus, problems with his knees, problems with his back, problems with his scalp and the subsequent surgeries he had--this is all documented information from REAL sources. Michael said he had developed a dependency to pain medications in 1993--he never called himself a "drug addict". Hack writers refuse to point out that Michael began taking the pain medications when a balloon was placed under his scalp to stretch his skin in an attempt to repair damage done by previous surgeries and the burn. He also had back issues while on tour and then developed issues with an abscessed tooth which he had to have surgery for just days prior to his departure from Mexico. He had reasons to take pain medications. There is no evidence Michael was ever using pain medications to attempt to quiet emotional pain or that he used these drugs for recreational purposes (euphoria). If anyone is to take these medications for any amount of time they will become dependent--that does not mean they are now drug addicts and are branded as such for life. If that was the case, then everyone should consider themselves a drug addict as we all have the potential to become dependent on drugs that cause dependence. It is the pharmacology, not the person, in that situation. If the Jackson Family was to take Michael's death and promote it as a way to learn about drug addiction they would be covering up the truth that their brother, their son, their uncle was in fact killed--take it upon yourself to decide if it was malpractice or murder. It pains me to see any comment by Stacy Brown regarding Michael Jackson. His track record is this: he speaks and writes tabloid trash about Michael Jackson to promote his career. He has come out of the woodwork recently to get attention. And here we are. Even Tom Mesereau had to weigh in. You have no credibility, Stacy Brown. Please stop talking about Michael Jackson. I am glad that more fans are writing articulate statements in support of Michael Jackson. The media is having a field day. We need to take a stand for this wonderful man. It's laughable that Stacy thinks he has any entitlement in speaking to fans. Is he still hoping to make money from us? Maybe he can explain where the heroin addiction Stacy claims Michael had went at the time of his death. He very publicly stated Michael had a heroin problem right after he died, I'm absolutely certain that the good hearted not at all money hungry Stacy Brown would never intentionally lie for money, would he? His addiction to MJ's money is the saddest addiction of all. Perhaps if we give them time - they will be able to come to grips with Michael's vulnerabilities in terms of his drug addiction. It's very easy for us to look in and see certain things, but it's not so easy to be objective when it comes to someone you idiolize, love and cherish - in a way his fans could not even begin to experience - the dynamics of family, sibling, parent-child relationships for normal people can be oh so strong sometimes that if tragedies happen, it can rip your heart out. Imagine if your brother, cousin or son was MICHAEL JACKSON also! Michael Jackson, in all his fame and glory, his impact on the world of music, his musical brilliance, since he was 3 years old he naturally understood music - he wasn't taught that, it was a gift from God. He was such an extraordinary human being, and they were in the presence of this gifted man on another level. Give them time. Thank you! Civil Suit - I think the Jackson family should also sue Dr. Murray in civil court. No, they don't need the money, but he shouldn't have all that money he collected from exploiting Michael's vulnerabilities and ignorance to what that medicine could do to him - $150,000.00 per month. I'm sure if Michael knew that propofol could kill him that way, he would have found another way to sleep or cut back on the usage.